In my recent haul post I showed you the Revlon 9 Super Lustrous Lip Cube, and a few of you requested a review and swatches. Based on the few products I have from Revlon I think it’s a great “drugstore” brand. I specifically like the Colorstay Foundation as well as the concealer. 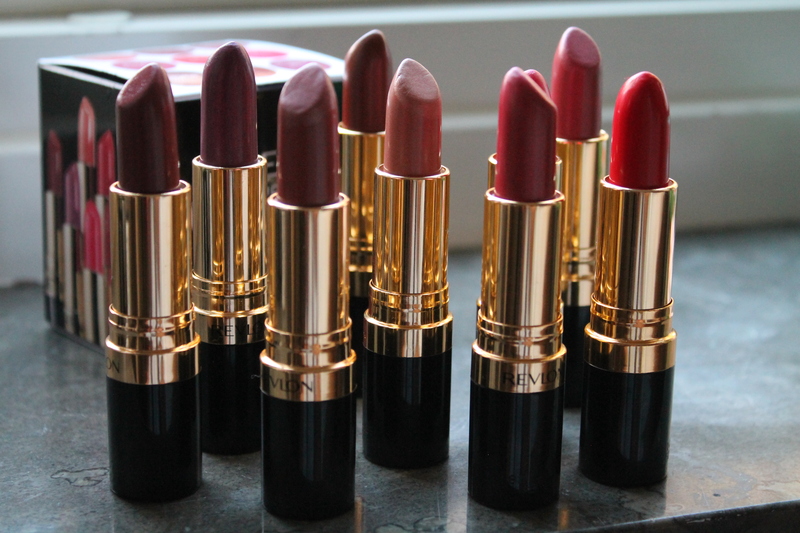 I only have one lipstick from Revlon in my makeup collection that I love! So can you imagine how excited I got when I saw this Lip Cube. The Lip Cube contains 9 full size lipsticks. Seven lipsticks have a pearl finish and two lipsticks are creme finish. The frost finish lipsticks have a silvery frosty finish and are quite sheer, which reminds me of MAC frost finish lipsticks. The formula is nice and soft and keeps your lips moisturised. However I’m not a huge fan of frost finish lipsticks at all, I just don’t think they look good on me.The two creme finish lipsticks on the other hand are more pigmented and vibrant, and remind me of amplified finish lipsticks from MAC. The packaging of all lipsticks are sleek and the gold gives the lipsticks a more luxurious feel. Since I don’t particularly like frost finish lipsticks and the majority of the lipsticks are frosty, I must say that I’m disappointed with this purchase. I expected this Lip Cube to come with different finishes:( The two creme finish lipsticks (Rum Raisin & Love That Red) are definitely my favourites in this Lip Cube. Overall the concept of the Lip Cube is great and would be perfect for someone who loves frost finish lipsticks. Which lipstick is your fave? What do you think of frost lipsticks? Yay or nay? I’m not a fan of frost lipsticks, but these look very nice! Maybe it also depends on skin tone, they all look gorgeous on you *. * All this kind of lippies I tried looked weird on me! Amazing swatches and great post! Oooh I love the look of rum raisin! Blushed is my favourite here, it looks so nice. I like the coffee been! I think they are nice but it tricky to pull off. The creamy finishes are very nice – especially Rum Raisin! Lovely Colours! The Rum Raisin is my personal fave! And I agree, you definitely do rock every single one! So lucky!